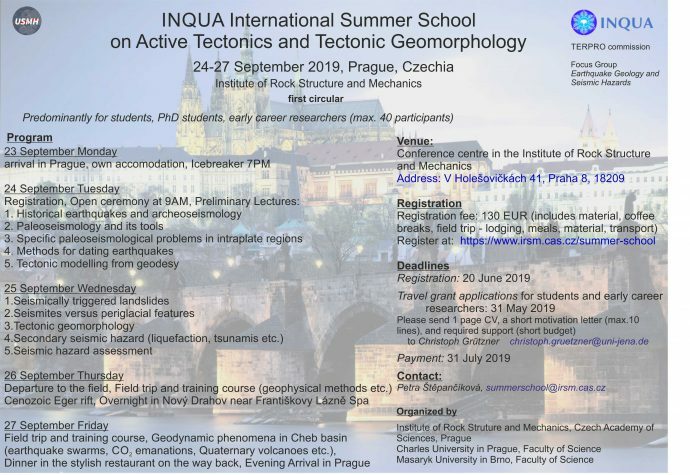 The INQUA Focus Group on Earthquake Geology and Seismic Hazards (EGSHaz) will run the International Summer School on Active Tectonics and Tectonic Geomorphology in Prague from 24-27 September, 2019. This event replaces the PATA Days this year and aims mainly at MSc./PhD students and Early Career Researchers. Please note that this is not a classical PATA Days event where new science will be shown and discussed. The summer school is organized by the Institute of Rock Structure and Mechanics, Czech Academy of Sciences and the Charles University in Prague, Faculty of Science. Please find a pdf of the first circular here. Structural Geology and Tectonics of Hokkaido: Geometric principles, and the relationship between active and ancient deformation. During this course you will learn how geologic structures, developed from microscopic to map scale, reflect the rates, directions, and mechanics of past and contemporary plate tectonics and deformation. You will also hone your three-dimensional perception and skills through practical applications. The Tectonic Studies Group (TSG) will organise a field trip to Death Valley in April 2017. The trip will be of particular interest for those who wish to learn more about tectono-volcanic processes, tectono-sedimentary processes, and the Basin and Range/ San Andreas system. An interesting summer school will be held near Cologne, Germany, from 21-27 August 2016. The GSGS Summer School on Dates and Rates of Change in the Quaternary is devoted to teach all different kinds of Quaternary dating methods such as Ar/Ar, cosmogenic nuclides, luminescence, palaeolimnology, palaeomagnetism, radiocarbon and tephrochronology. It is designed for PhD students, postdoctoral researchers and advanced master’s students in geosciences and will be held in English. Deadline for application is 10 June. The workshop is free for all accepted participants. The summer school is funded through the Institutional Strategy of the University of Cologne and supported by the Geoverbund ABC/J. That’s a great opportunity, make sure to apply before it’s too late! Thanks to Silke for spreading the news. The Deform2015 school on Active Deformation, Faults and Earthquakes from Measurements to Models will be held in Southern France from 7-13 February, 2015. Over the past years, considerable advances have been made in observing crustal deformation at scales of seconds to thousands of years. working on different aspects of active faulting and earthquake processes. This school will provide a state-of-the-art view of the technics used to study active deformation as well as a perspective on the current models integrating the growing corpus of available data.